I'm back from MIGS! It was actually a really fantastic trip. Montréal is an awesome city and MIGS is a great conference. Small, but small in a good way. Got to hang with some awesome folks, hear some awesome talks and eat some awesome poutine. 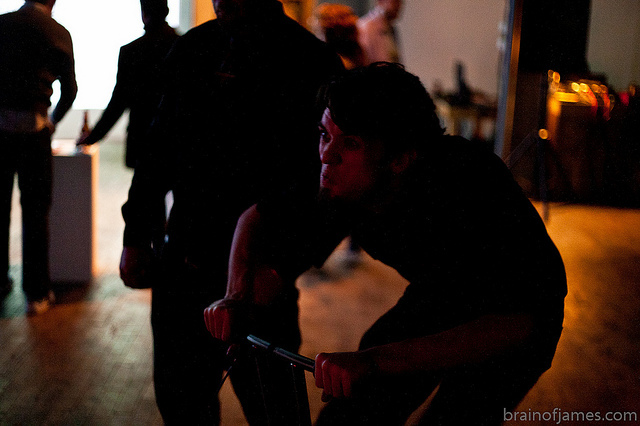 The insane photo above is me playing some weird exercise biking through bloody veins game at The Prince of Arcade, which was put on by the Mount Royal Game Society. I also gave my talk about 2D platformers, indie darlings and meaningful games. I thought it went well, although I think I burned through it at a pace even more horrifying than when I rehearsed. I believe the audio for the talk will be available soon (heh, if you don't mind your ears catching on fire at the rate of my delivery) but in the mean time, I thought I'd post my slides and the text I used to prepare the talk. I cannot guarantee that the text is the same as the words that came out of my mouth on the day of (in fact I promise it's not), but it's close enough to be well representative. Heh, it's actually probably more thoughtful and composed that whatever I burned through that day. There's a Word .doc and a .ppt. There are bolded words in the .doc and those are the "advance the presentation" markers. If you had any thoughts, feedback, whatever, I'd be delighted to hear it! Thanks to everyone that came and to the organizers for setting up a wicked conference. Hopefully I'll be able to enjoy some more Montréal in the future. Thanks a lot for the slides and notes – great stuff! A highlight of the talk for me is where you talk about recontextualizing and subverting expectations. I like when there’re practical things like that in talks, and I know I'll be able to identify and perhaps use these from now on. Are there similar techniques you identified but couldn't include in your talk? - In Bioshock, your character beats Andrew Ryan to death without you having control over it. It forces you to re-evaluate how you played up to that point, and how you followed objectives without questioning them. - In Brenda Brathwaite's Train, you are told the destination of your wagon when you reach your objective. As you learn the wagon arrived at a concentration camp, there's a similar process or re-evaluating how you played the game. Its great to see your back! Love the picture at the top, and I'll keep a look out for the audio even if it may burn my ears. I also cut a brief reference to Thinking in Systems and how nearly all game developers would benefit from a better understanding of systems analysis. Yeah, obviously Bioshock does a great job of subverting the expectation of the (total game trope) voice-in-your-ear character being honest and acting in your best interest. Train does the same thing for sure. The trick bit with Bioshock at least is while that revelation is fantastic, it doesn't change anything about how you play the game. I mean, maybe at that point if you were harvesting Little Sisters instead of saving them you could switch around, but nothing else could even really change. Now I haven't played Train of course, so I can't say for sure, but the concentration camp revelation does allow the players to choose to behave differently. I'm not sure how differently, or how great an impact that change can have.